A Michigan author recently visited with students at Sugarbush Elementary via video conference to discuss one of her books and get them excited about writing. As part of their adventure/action unit during reading, fourth-graders at the Chesterfield Township school read the book “Journey Back to Lumberjack Camp” by Owosso-native Janie Lynn Panagopoulos. The fiction-based novel features an adventure-filled storyline based on the lumberjack era in the Upper Peninsula, said fourth-grade teacher Christine Akroush. On March 31, Panagopoulos joined the students via video conference during a lumberjack breakfast that has now become a tradition at the school, Akroush said. Inspired by the book, the breakfast included eggs, pancakes, bacon, sausage, hash browns and pie. 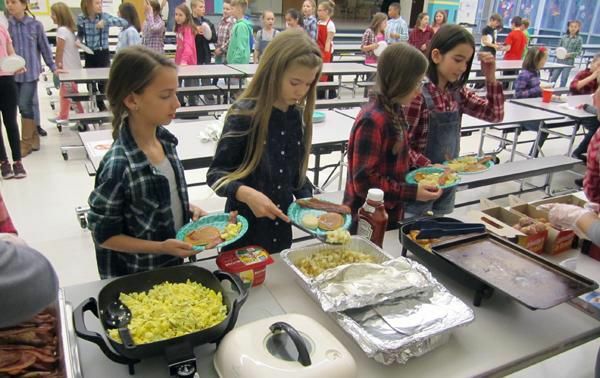 “It was a breakfast worthy of feeding a group of hungry and hardworking lumberjacks,” she said, noting that the students even donned plaid clothing. Each student had a chance to ask the author questions about her book, as well as about becoming an author and the writing process. Akroush said the breakfast was the perfect way to close out “March is Reading Month,” as students showed an eagerness to work on their writing skills.